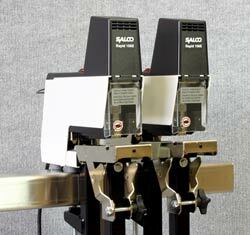 Salco R106 Gangster® (dual) electric stapler with two 2.4-inch narrow table. Designed for flat and saddle stapling. The stapler uses heavy duty 44 series staples, 1/4" & 5/16" leg length. Made in Sweden. Rapid 24 staples. 5/16-inch leg, galvanized. 5,000/box. Rapid 24 (24/6) staples 1/4-inch leg, galv. 5,000 per box.